We arrived in St. Jean on Monday, May 25. It’s about a two-hour bus ride from Pamplona to St. Jean. 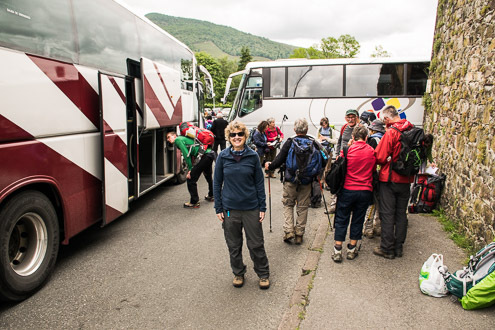 We could tell from the number of walking sticks and packs stowed in the bus’s baggage compartment that there were quite a few other pilgrims aboard. When the bus arrived in St. Jean, there was lots of excitement as hikers got off the bus, picked up their packs, and began walking into town. Our first stop was the pilgrim office, and we wandered around a bit before finally finding the street where it was located. There was a short line into a room staffed with friendly people who spoke several languages. That’s where a kind woman named Brigitina helped us get our pilgrim passports and scallop shells. 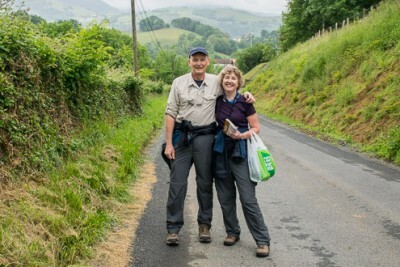 She also gave us some good advice about the first day’s walk. Next, we walked around town, looking for a place to spend the night. We already knew that, because of the rainy, overcast weather, we were going to spend Tuesday in St. Jean and delay the start of our hike until Wednesday, when the weather was supposed to clear. We weren’t sure whether it was OK to stay in an albergue if we weren’t leaving in the morning, so we decided to stay in a hotel. We walked back down the main street and quickly found a cute little hotel. After we checked in, we dropped off our packs and started exploring the town. That night we had our first dinner from the pilgrim menu at a local restaurant. Chris went to bed early. She was still recovering from a cold she had picked up in New York City. 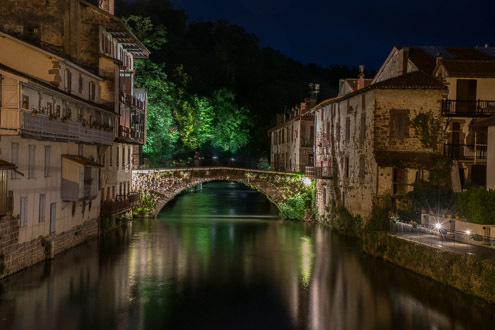 After dinner, I grabbed my tripod and camera and walked around town for a couple of hours, photographing St. Jean in the twilight and then after dark. Because most albergues have curfews, and the pilgrims who were leaving the next day wanted to get a good night’s sleep, the streets were almost empty by 9:00 p.m.
We decided to spend some time on Tuesday hiking the first couple of miles of the trail. There are a couple of trail options, and we wanted to be sure we didn’t take the wrong path out of town! So, the next morning, we headed down the main street, over the river, and started up the trail. The trail follows a road out of town, and it starts to climb quickly. The day was overcast, with a light mist, but the scenery was beautiful. The landscape quickly became rural with lots of small farms. Cows, small vegetable and flower gardens, and green hills were all part of the landscape. About two miles or so up the road it began to rain, so we turned around and headed back to St. Jean. The weather began to clear by the afternoon, and we spent the rest of the day wandering around the old town in St. Jean. There were lots of interesting places to see: the walk along the river Nive, an old Roman bridge, and the Citadelle. It was also interesting just to hang out on the main street through the old part of town, watching pilgrims pass through. We kept on eye on the clouds, hoping the weather really was getting better–and by late afternoon it looked promising. That night we stayed in an albergue called the Beilari. It’s located in a house dating from the 17th century. A wonderful host named Joxelu and a cook named Greta took great care of us. We shared a delicious dinner and Joxelu hosted some community-building activities to help us get to know each other. Our first albergue sleeping experience was also a luxurious one because Chris and I had a room to ourselves. We set the alarms on our phones and climbed into our sleeping bags, looking forward to the first day of walking.